FDA Listed Tuttnauer 3870EA Large Capacity Automatic Autoclave Sterilizer (Autoclave In Back Of Picture). This is a professional grade sterilizer and is perfect for all General Medical, Dental, Chiropody, Veterniary, Laboratory Tattooing, Body Piercing, Health, Manicure, Pedicure and Cosmetic applications. 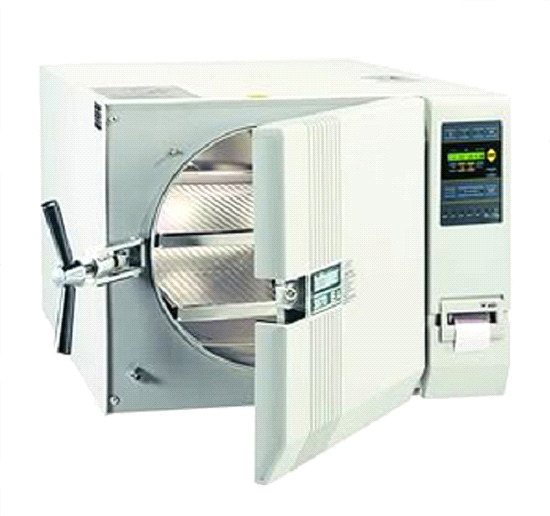 We have these autoclaves in stock and it will ship out the same day your payment is received. Today, dental and medical clinics are voicing the demand for better sterilization. Tuttnauer is your partner in protecting your patients and gaining their trust. Our state of the art sterilization technologies are designed to deliver quality without compromise. Tuttnauer Automatic Autoclaves produce the highest return on your investment. Please e-mail or call me at (701)223-9936 or Toll Free (800)355-2956 with any questions or concerns you may have about using this clinical grade autoclave.